Far Cry New Dawn hands you its best and most fun weapon almost immediately, but then just as quickly takes it back off you. However, it’s possible to get the best gun in Far Cry New Dawn almost immediately after starting the game proper. We’re talking about the Saw Launcher, a deadly weapon with ammo you can reclaim once you’ve used it. You get your hands on the Saw Launcher at the very beginning, but twin sisters, Mickey and Lou take it off you when you’re kicked into the river. Now, once you head to Prosperity and have to begin to rebuild the basecamp, you’ll want to get the Saw Launcher back. Why is it the best gun in Far Cry New Dawn? Firstly, it’s silent so won’t alert guards when you’re using it for stealth attacks. Secondly, you can loot a body afterwards and take back the saw blade you fired, so it’s essentially unlimited ammo. Thirdly, and most importantly, the Saw Launcher blades ricochet off metal and brick taking out multiple enemies with one shot. If three or four bad guys are close to each other, you can instantly kill all of them with one well-aimed pull of the trigger. You don’t even need to aim that accurately – just pull the trigger and the blades will churn through guards like a hot knife through butter. Once you arrive at Prosperity, you’ll need to rebuild the camp by stealing ethanol and recruiting Specialists. Focus on one recruit in particular – Grace Armstrong. She’s already marked on the map, but is a little further away than other Specialists. It’s worth the effort to go here first, as doing her mission will give you the Saw Launcher. When you arrive at Grace’s location you’ll have to take out a few bad guys. She tells you she’s blind, but knows where to find a new weapon, along with some essential supplies. She marks the train yard on your map, so head there. Don’t waste time taking out all the guards first. You can kill them all quicker and more efficiently using the Saw Blade. It’s in the main building and it’s marked on your map. Grab it, along with ammo. You’ll now have to grab three lots of supplies to complete the mission. This is the perfect place to get to grips with the Saw Launcher, as blades bounce off shipping containers and do most of the hard work for you. One set of supplies is in a shipping container in the middle of the yard with a locked door. Open this and get out the way, as a stench of skunks will be set free – stand back and they’ll attack the guards and any reinforcements. There’s also a caged bear here, so stand on high ground and shoot the lock on its cage and it will also cause chaos. 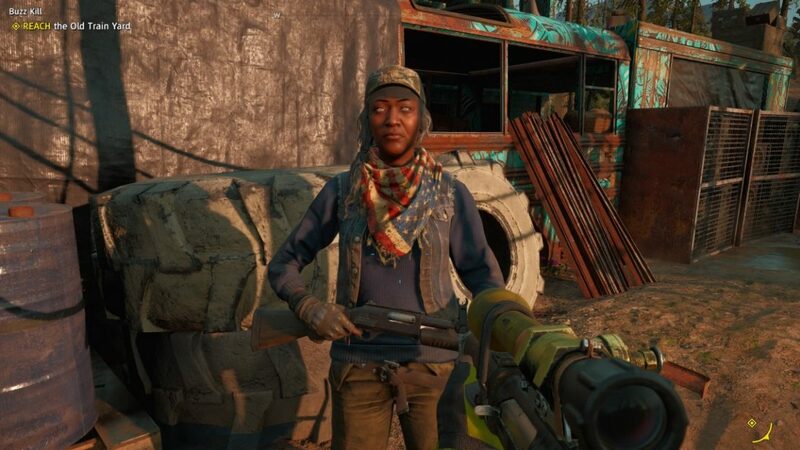 Once you’ve found all three lots of supplies, meet back up with Grace Armstrong and she’ll give you the Saw Launcher, the best weapon in Far Cry New Dawn. Go cause chaos and have fun! We have a whole hot mess of tips for Far Cry New Dawn here, and a full walkthrough to The Prophecy mission, detailing how to align the Eden’s Gate amulet.